Every parent worries that their child will become a victim of bullying in school. This is because at some point, most children will be bullied. Some are bullied chronically. For every child who is bullied, there is a parent who is struggling to help them and who is desperate for help. The good news is that teaching kids how to get bullies to leave them alone is actually quite simple. The problem is that most parents don’t know what these skills are, let alone, how to teach them. If you feel like me, that bullying is something we should be actively doing something about and trying to prevent, then together we need to make a serious effort to educate parents and empower them. When a parent learns why bullies bully and how to control the bullying dynamic, they can then teach these skills to their children. It is critical that parents be taught this information. Not only are they responsible for teaching their kids these important skills, children need their parents support and help to navigate these difficult relationships. Getting a bully to stop is hard. It takes time and there are no quick fixes. Parents need to encourage their child through the learning process so that they can find the courage to stand up and defend themselves. If your ideal customer is a parent of a young child or a middle schooler, my book, The Bully Vaccine would make an excellent gift or incentive. It is an wonderful way to give your customers a gift they actually need and that will make a difference in their lives and in the lives of their children. 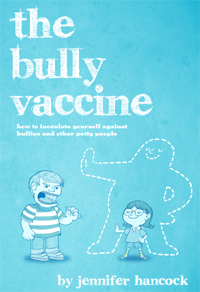 Please consider purchasing multiple copies of The Bully Vaccine to give away as a customer incentive or free gift. You can help your customers, create good will and do something positive to help children who are suffering at the hands of a bully all at the same time. The Bully Vaccine retails for $7.99. I can offer you a bulk rate of $5 book plus the cost of shipping. The more books you buy – the deeper the discount. For instance, if you purchase 200 books – you pay only $3.50 per book. I wrote my book because I felt I had a moral obligation to share my knowledge and to help children who are suffering at the hands of a bully. The techniques I teach in my book work. They are based on well known and well studied behavioral management principles. All I have done is explain these techniques in a way that makes them accessible to everyone. If you decide to give away my book to your customers. Please encourage them to read it, learn from it, teach it to their children and then pass it on by donating their copy to their local public or school library as a way to pay this knowledge forward so it can benefit someone else.